Since 1980, RISMedia Real Estate magazine is the publication of choice for real estate’s most profitable and productive professionals and all those looking to gain a competitive edge. Real Estate magazine is the only national, independent magazine specializing in the residential real estate and relocation industries, covering all aspects of the industry, including special sections on business development, coaching and technology. Editorial includes a broad range of coverage from expert commentary to client testimonials, detailed feature stories and in-depth analytical cover stories providing exclusive insight into the nation’s most successful businesses. Our Readership: Real Estate magazine targets a very specific audience of real estate decision makers who are empowered to purchase goods and services, including: Networks & Franchises: Executive teams from America’s larges residential real estate corporations, including: Century 21; Coldwell Banker; ERA; Sotheby’s International Realty; EXIT Realty; HomeServices of America; Keller Williams; Leading Real Estate Companies of the World; Realty Executives; RE/MAX International; Weichert Real Estate Affiliates. Power Brokers: Owners and executive teams at more than 1000 of America’s largest residential real estate brokerage firms. Top Producing Associates and Managers Board and State Associations 900+ boards and 1,900+ officers Real Estate and Relocation Service Firms Leading industry executives from relocation management firms, referral networks, MLS vendors, banks, mortgage companies, moving services and title, appraisal, inspection and insurance companies, Corporations Relocation directors of America’s largest corporations Each year our readership generates significant sales of the following products and services: Technology hardware and software New mortgages and home refinances Home warranty and insurance Interim housing services Household goods shipments Environmental tests and home inspections Fee appraisals Furniture rentals At http://magazine.rismedia.com/, readers can also access the digital version of RISMedia’s Real Estate magazine, a unique interactive experience that allows readers convenient access to our monthly print publication, whenever and wherever they need it. 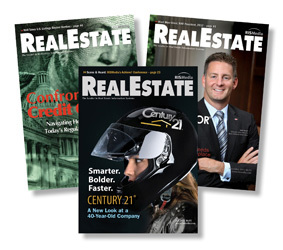 Real Estate magazine online is viewed by an audience of our more than 300,000 online readers.